The last thing Peter Gethers’ father ever did on his deathbed was make a joke. And they hope Chicago audiences will laugh with them when the Off-Broadway hit play “Old Jews Telling Jokes” makes its Windy City premiere this fall. The show runs on the Main Stage of the Royal George Theatre in Chicago, from Sept. 24 to Feb. 16, and officially opens Oct. 2. Directed by Mark Bruni, associate director of “The Book of Mormon” Chicago production, the play presents a revue, with musical interludes, that pays homage to Jewish humor. The idea for the show was born out of a website “OldJewsTellingJokes.com,” which lives up to its name. “The website was hilarious and kind of amazing,” Gethers said. But if you go to the show, don’t expect to watch just, well, old Jews telling jokes. The play showcases five actors—Dara Cameron, Alex Goodrich, Tim Kazurinsky, Renee Matthews, and Gene Weygandt—of all different ages, telling five monologues, stories based loosely on the writers. Baby boomers Gethers and Okrent say they grew up in funny Jewish homes. “Mine was a depressed Jewish home with moments of humor,” jokes Okrent. 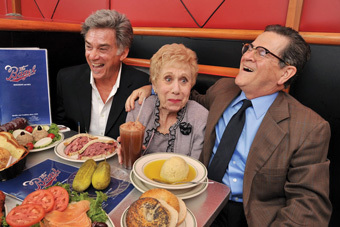 “And mine,” adds Gethers, “was a funny Jewish home with moments of depression.” From as early as they can remember, they were raised on a steady diet of comedy albums by the greats—old time comedians like Bill Dana, Shelly Berman, Henny Youngman, and Woody Allen.